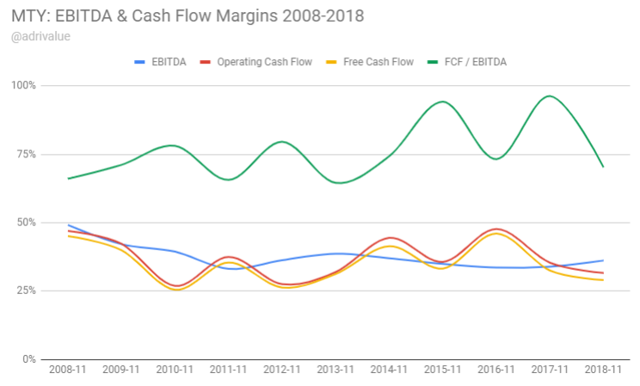 The current negative market sentiment represents an opportunity to buy a growing cash flow machine for about 12x P/CFOPS, when the 5-Year median is above 16x. 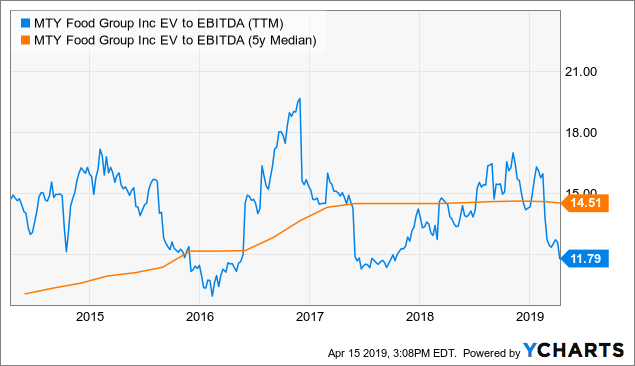 Even if Papa Murphy's wouldn't generate a single dollar of EBITDA, MTY Food would still be trading at a historical low EV/EBITDA, below its 5-Year median. I will analyze the business model of the company and the acquisition of Papa Murphy's. According to my valuation, I estimate an intrinsic value between C$74.13 to C$81.51, or an upside potential from 35% to 48%. 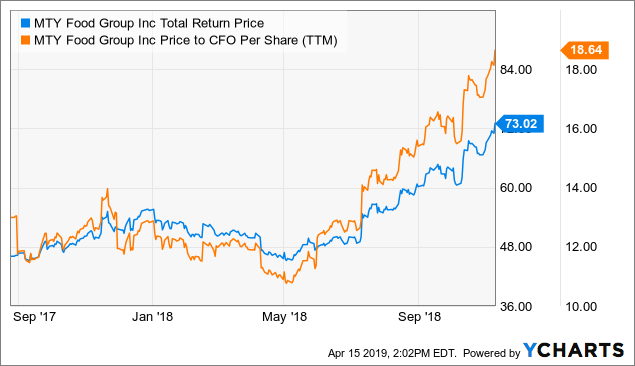 In April 11, 2019, MTY Food (OTC:MTYFF) announced its quarterly results and the acquisition of Papa Murphy's (FRSH), which would be the third largest deal of the company. Mr. Market didn't like the results, the acquisition or none of them. 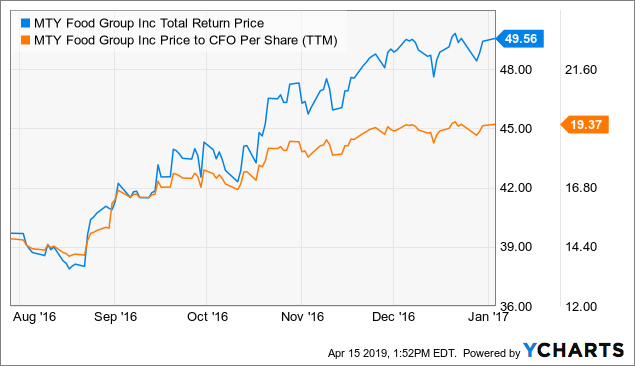 I'll explain why I think that MTY Food's shares are deeply undervalued. This could represent a short to mid-term upside potential of 35% to 48%, with a target share price from C$74.13 to C$81.51. Please note that all the financial figures and share prices will be on Canadian Dollars, unless otherwise noted, as it is the reporting currency of the company. MTY Food is a diversified franchisor, 99% of its locations are franchised. Some investors think about the company as an operator, but the main risks are assumed by the franchisees, like the high operating leverage, opening and closure costs, working capital requirements, etc. The diversified portfolio of different restaurant concepts and brands provides additional security to the business model. Roll-up strategy, the management team has the ability and the patience to acquire businesses at low multiples and the required knowledge to successfully integrate restaurant chains. From time to time, they announce a bigger transformational acquisition like they previously did with Kahala Brands and Imvescor. 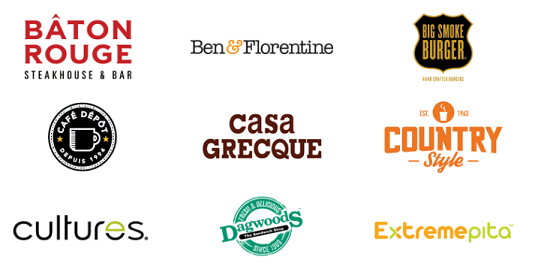 MTY Food's current portfolio contains more than 80 brands. Most of them were acquired by the company during the last two decades (its first acquisition was made in 1999), while other brands or concepts were developed by the company. 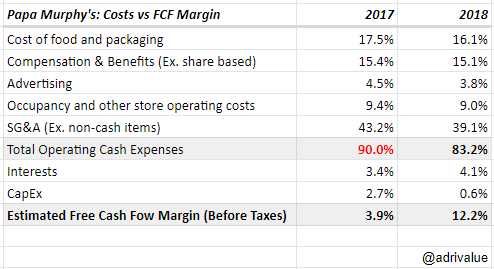 Wait, the FCF margin is - sometimes - higher than the EBITDA, how can this be possible? Negative Working Capital, the franchisors are financing company's growth, year after year. In other words, the company does not need to deploy additional capital to finance the organic growth, the franchisees will pay for the new store openings -and closures -. I'll talk about these factors in the following sections. The company reported a -1.4% SSS decline during the first quarter of the fiscal year 2019, which is below the previous reported -0.23% SSS decline for the FY2018. The company has a record of negative SSS, but they didn't affect the diversified franchisor business of MTY Food as it would damage a restaurant operator or a one-franchise business as it was Papa Murphy's. I will explain why I think that. As you can see, the company reported positive SSS just in two of the last ten years. With this poor performance of SSS, most investors would think that this is a bad business, right? This does not seem the share price graph of a bad business, right? It seems clear to me that the recurrent negative SSS did not have a direct impact in the business profitability and/or long-term returns. Source: Author using data from Google Finance. 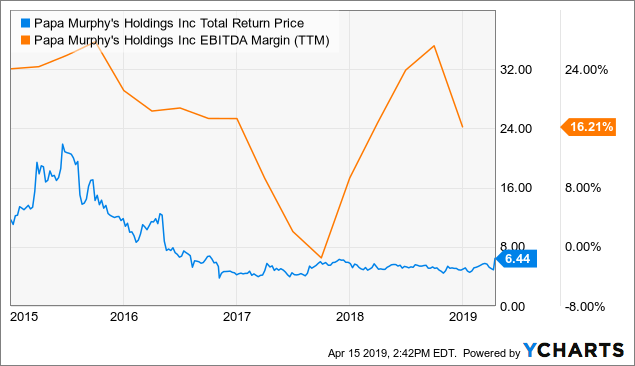 A shareholder who had purchased MTY Food shares in its debut on the Toronto Exchange Market at closing with a share price of C$11.69, would have a CAGR of 20% as of April 15, 2019 on his investment. Not bad for a company with recurrent negative SSS, isn't it? But, how does the company achieve this outstanding long-term return with negative SSS? The average monthly sales of the stores closed during 2015 were approximately $18,700, while the average monthly sales of stores opened during 2015 were approximately $34,000. The total combined sales of the stores opened during 2015 were approximately $0.5M more than the total combined sales of the stores that were closed. - Source: Company's 2015 Annual Report. It would be fantastic for the company to have recurrent positive SSS growth, but the point is that they don't affect the business as much as most investors think. Don't get me wrong, the company isn't immune to negative to SSS, but a low single-digit decline - i.e. between -1% and -1.5% - didn't affect the long-term profitability of the company nor damaged the shareholder's returns as I've justified above. But, a higher decline in the SSS would - probably - decrease the company's margins and couldn't be sustainable in the long-term. The company announced the acquisition of Papa Murphy's restaurants chain at the same time as the Q1 2019 results were announced. 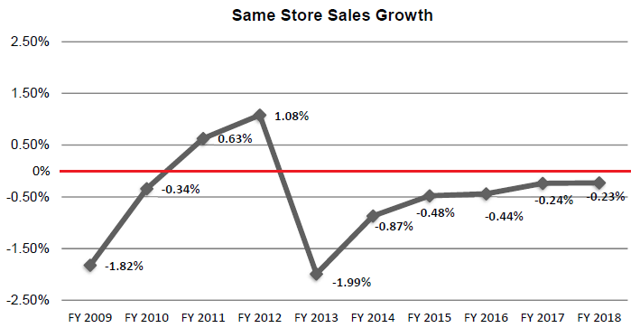 Business Performance, the business is still recovering from three hard years of negative Same-store sales. The decline in the SSS bottomed during the Q4 2016 with a huge -7.8%. Since then, the SSS show an upward trend, but it is still insufficient to achieve positive SSS. The company named a new CEO in July 2017 and the business is still trying to achieve positive SSS after three years of efforts. In my opinion, the concerns about the business performance are justified. But, during the latest conference call, Weldon Spangler - Papa Murphy's CEO - reported some positive information. Maybe the company is seeing the 'light at the end of the tunnel'. Results represented continued sequential improvement and included positive same-store sales in the month of October (...) we again saw an increasing number of markets comp positively with 48 domestic DMAs showing growth in the quarter, up from 39 in the third quarter (...) we will see this gap close, and the system will return to positive comp sales growth. Source: Author using company filings. Financial figures in US Dollars. 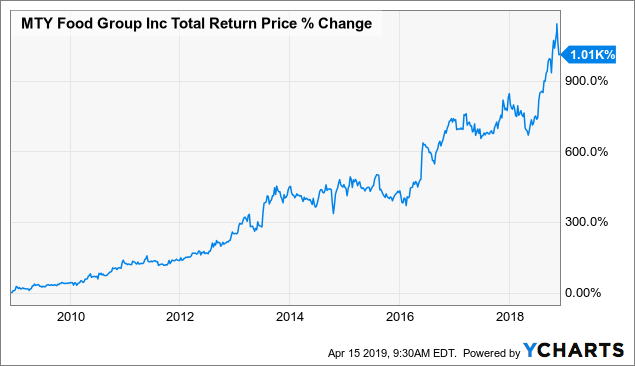 Then, it is clear that Papa Murphy's is a lower-margin business than Imvescor or Kahala Brands, but the company also paid a lower multiple for it. I think that it is a too high multiple for a troubled and leveraged acquisition. We'll see if this multiple is adequate - or not - in the following quarters. But, MTY Food's management team deserves some credit after two decades of M&A. They have a lot of experience integrating restaurant chains and improving their margins, as well as developing new restaurant concepts. That's why I believe that they will be able to expand Papa Murphy's margins. Source: Author using company filings. Please note that I'm excluding non-cash costs like share-based compensation, depreciation, amortization and non-cash items. Costs of sales: MTY Food has its own food processing plant and distribution centers. The company sells the ingredients directly to the franchisees, with a very low profit margin. This could increase the gross margin of Papa Murphy's. Interests: the US$77.4 million debt of Papa Murphy's will be fully repaid by MTY Food, so the acquired business won't have to pay for this item, which will be now a 'central cost'. The company will pay for the acquisition with its existing cash plus debt. I estimate that Papa Murphy's was paying an interest rate of about ~7%, while MTY Food is paying ~4.4% in interests for its long-term debt. This lower interest rate would represent a decrease of ~US$2 million in annual interests paid. Our portfolio focus remains on ensuring that we find the right franchise partners to take over our company-operated stores as we work towards returning to at least a 95% franchised system with no more than 50 company-owned stores by the end of 2020. 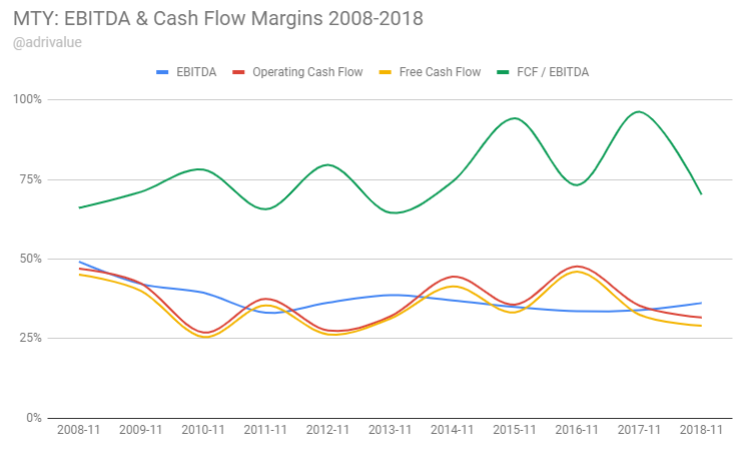 At the end of 2018, Papa Murphy's had 106 corporate locations, so this reduction ~56 corporate stores would represent a decrease in the operating leverage and a cash flow income, from the franchisee paying for the location. For example, during 2018 the company reported that 29 stores that were refranchised. 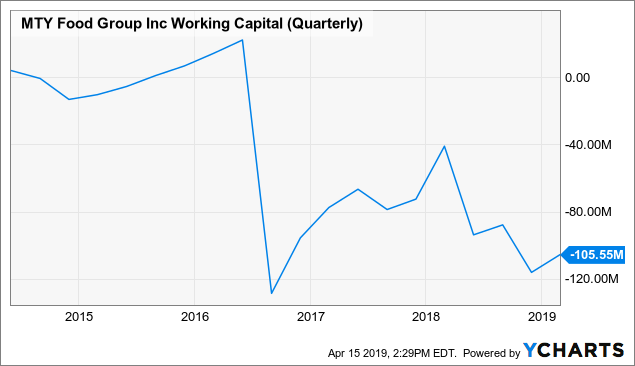 According to the reported Cash Flows of Papa Murphy's, this represented a cash income of US$7.6 million or US$260,000 per each refranchised location. So, if the company is able to refranchise these 56 stores, this would represent a cash flow income of ~US$14.6 million until the end of 2020. Besides, in 2018 the company reduced its SG&A expenses from US$64.6 million in the FY2017 to US$49.7 million in FY2018, or a US$14.8 million decrease. The net reduction in corporate stores was 39 in the FY2018 (29 refranchised and 10 closed), so the SG&A savings were about ~US$380,000 per store. This would represent a reduction of US$21.3 million in SG&A annual expenses if the company is able to refranchise the mentioned 56 stores, or a -43% expense in annual SG&A. In 2018, we recorded a net loss on refranchising of $1.2 million, which included a $1.5 million contingent liability for marketing support. - Source: Company's 2018 10-K. Some of these one-off expenses were non-cash items like asset impairments. I think that Papa Murphy's will benefit from the access to the network of franchisees of MTY Food, this could accelerate the refranchise of these locations. 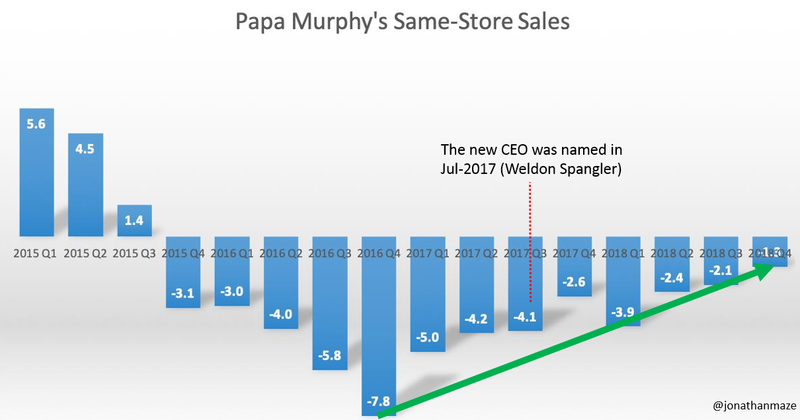 For the mentioned reasons, I wouldn't be surprised if the SG&A expenses of Papa Murphy's get a 30-40% cut in the upcoming 1-2 years and the EBITDA margin improves to 25%-30%. But this margin expansion will also depend on the recovery of the SSS, all the efforts will be in vain if the same-store sales get worse. I would be happy if MTY Food is able to maintain the SSS - at least - flat. Let me be clear, I'm not a fan of technical analysis, but sometimes it helps to know the story of a company and the current market sentiment. I like the quantitative indicators like the Relative Strength. I'm not telling you to buy always that the RSI goes below 30 above or sell when it is above 70. This index could be useful as an 'alarm', to see what's happening with the business, like I'm doing since the acquisition of Papa Murphy's. 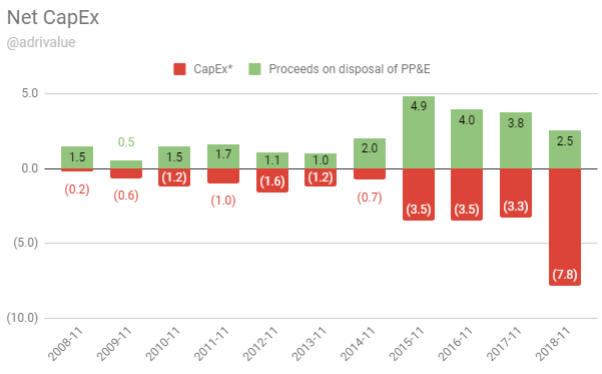 Using a fundamental focus, we can see that the P/CFO Per share was deeply undervalued during 2016 or between 2017 and 2018, while the 5-Year Median is above 16x. Let's suppose that this investor bought the shares at C$40 in August 2016 and sold at C$48 when the stock was trading above 20x P/CFOPS in December. He would have obtained a total return of 18% on his investment, in about 4 months, or an IRR of ~72%. 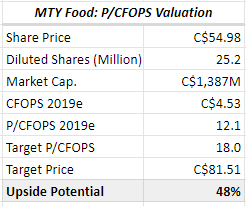 Let's imagine that this audacious investor bought MTY Food's shares again, when they were trading at 12x P/CFOPS during September 2017 at C$48. It wasn't a great timing because they traded well below in May, right? This would have been a great opportunity to buy more, but let's forget that. If this investor would have sold at C$80 when the stock was trading close to 18x P/CFOPS in September 2018. Then, he would have obtained a total return of ~67% in 13 months, or an IRR of ~60%. 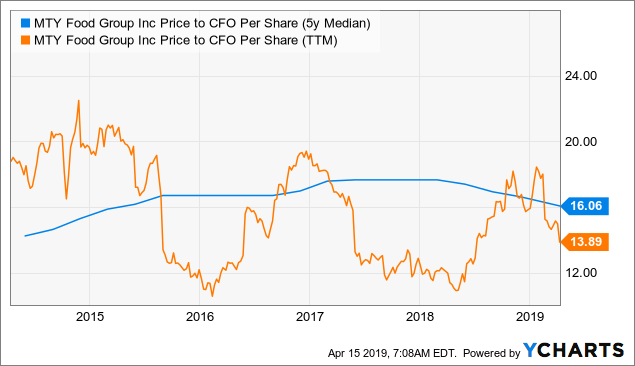 I estimate that the company is trading closer to a P/CFOPS multiple of 12x for the FY2019. I won't sell a single share until it trades at 19-20x, which I consider a 'fair multiple' for MTY Food. Source: Author using his own estimates. Please note that the 'Pro forma' EBITDA represents the Adjusted EBITDA that the 'combined company' generated in the last twelve months. 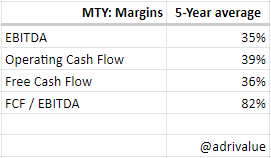 I think that this could represent a short to mid-term upside, if the market decides to value MTY Food at the 5-Year EV/EBITDA median multiple of 14.5x or above. Even if the acquired company would generate zero dollars of EBITDA, the remaining businesses of MTY Food would generate ~C$142 million. This would represent an EV/EBITDA of 13.3x, again below the 5-Year median. That's completely irrational. 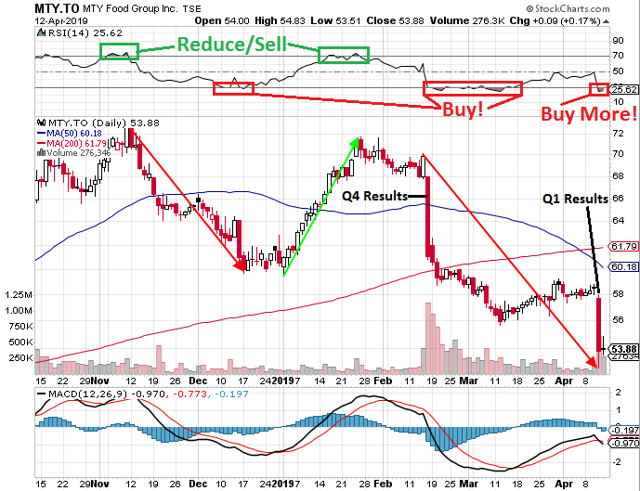 I believe that MTY Food's shares are deeply undervalued and this represents a good opportunity to profit from a short to mid-term trade. But I also consider this stock as a potential buy & hold investment. In my opinion, a defensive business always fits well in a diversified portfolio, bought at a fair price, of course. 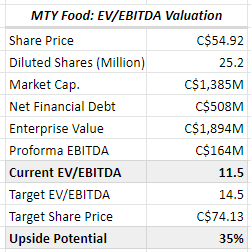 I bought my first shares of MTY Food at ~C$46 in mid-2017 and I've never sold a single share. You may want a defensive business in your portfolio like it is MTY Food. 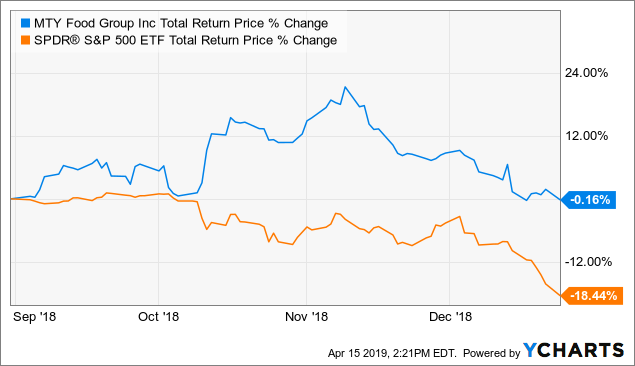 The company's shares vastly outperformed the S&P 500 index since September to the December 24 lows, with almost a 'flat' return versus a -18.4% decline in the S&P 500 ETF (SPY). Don't forget to draw your own conclusions. Disclosure: I am/we are long MTYFF. I wrote this article myself, and it expresses my own opinions. I am not receiving compensation for it (other than from Seeking Alpha). I have no business relationship with any company whose stock is mentioned in this article. Additional disclosure: This article does not represent any kind of investment recommendation or advice.